Sadly, most American households wrinkle their noses at the mere mention of this valuable, all powerful and sorely misunderstood vegetable. The word cabbage is usually enough to send children to their rooms with a myraid of excuses as to why they may not wish to eat their evening meal. While cabbage is a delicious and healthful staple in other countries, it is almost foreign to Americans, with the exception of good old fashioned cole slaw. Do recognize that this American cabbage specific, mayonnaise laden dish full of hydrogenated oils and other unmentionables, absolutely ruins the reason for eating such a healthful food in the first place. Cabbage is a sturdy, strong and abundant vegetable. Hardy and easy to grow, it is almost universally available in all countries and cultures. Cabbage belongs to the all important family of cruciferous vegetables. The members of this family of vegetables are so named for their cross shaped (crucifer) flower petals. Rich in nutrition and fiber, cabbage is an absolutely phenomenal source of Vitamin C. Even more impressive is that cabbage is famous for a specialized, naturally occurring, nitrogenous compound known as indoles. Current research indicates that indoles can lower the risk of various forms of cancer. Cabbage was popular with the ancient Greeks and Romans. An early Roman medicinal preperation blended lard with the ashes of burnt cabbage to make an ointment for disinfecting wounds. Throughout history, the Asian diet has been rich and abundant in cabbage and its various varieties. Epidemiological studies have found that men living in China and Japan experience a much lower rate of prostate cancer than their American counterparts. Similar data has been uncovered regarding breast cancer rates among women. It is no wonder that the lowely, plain, boring cabbage gets rave reviews from the world of nutritionists. Cabbage is relatively cheap yet one of the richest when it comes to protective vitamins. Talk about the original weight loss food! One cup of cabbage contains only around 15 calories. Modern science has proven beyond a reasonable doubt that the health benefits and therapeutic value of cabbage, which also plays a role in the inhibition of infections and ulcers. Cabbage extracts have been proven to kill certain viruses and bacteria in the laboratory setting. Cabbage boosts the immune system's ability to produce more antibodies. Cabbage provides high levels of iron and sulphur, minerals that work in part as cleansing agents for the digestive system. There are many different varieties of cabbage, so please, be brave and innovative. 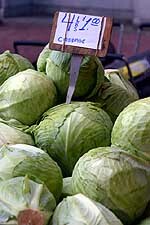 Green cabbage is the most popular, common and of course the one we are most familiar with. Take a walk on the wild side with Savoy cabbage. With yellow crinkled leaves, you can use this variety of cabbage as an alternate in many recipes. Let's not forget Bok Choy, a routine addition to Chinese recipes that has a sweet, light, celery type familiarity. Red Cabbage. It goes without saying in that it simply has to be good for you given all that beautiful plant pigment where the majority of nutrition is stored. Red cabbage is good in salads and is commonly pickled. Napa cabbage has a mild sweet taste and is incredible in stir fry dishes. Whatever your choice of cabbage may be, enjoy a serving at least once a week along with your other valuable and health promoting cruciferous vegetables. Try to cook your cabbage lightly. Steaming and quick stir fry dishes are considered to be the best methods for preserving the power packed natural nutrition given so freely by Mother Nature. Cabbage soup anyone?